Last night, we fed Eleanor rice cereal for the first time. (Yesterday was her four-month birthday.) I have to say, as a Mommy, it was a bittersweet moment. I'm excited that Eleanor is moving to new stages in her life, but sad that she's not my tiny, little baby anymore. She's doing so many new things now. We're amazed everyday at how much she is learning! We all three had so much fun! What a blessing to experience these milestones together as family! She looks like she really enjoyed her cereal in the second picture. What great pictures! I have some neat recipes for some baby purees when she's ready. You will find that you really enjoy introducing her to new foods. But, I totally get what you are saying about her growing up so fast!! Looks like she loves it! 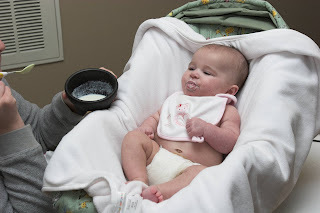 Feeding Grace solids has been a struggle for us, so I hope it is easier for you guys!